I have heard so many bloggers talking about the 'effect' of Molecule 01, and always wondered what the deal was. 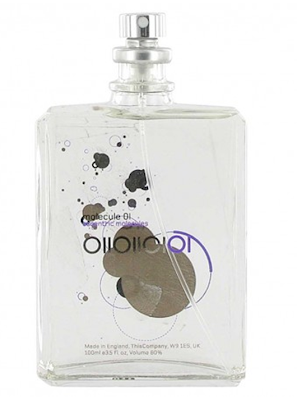 Molecule 01 contains the only aroma-chemical Iso E Super, which on its own is less of a fragrance more of an effect. The wearer (so I've been told) will notice a subtle, velvety, woody note which will disappear and then re-surface after sometime. The wearer WILL notice the impact of the fragrance on other people because Molecule 01 lends indefinable allure to the wearer. This has sold me on the product already, a perfume with its own unique personality that blends with the wearer to create its own smell - your own bespoke fragrance without the huge expense! Apply Escentric Molecules fragrance to the skin whenever you like, and kick back and watch the trail of distraction in your wake. It contains one molecule, no more no less, meaning that you get what you pay for, along with the added bonus of not smelling like everyone else because this will be your own fragrance, and no one else will smell like you. The fragrance is also unisex so it will make a great gift for that special (guy)someone in your life too. Who else is with me?? I've been dying to try this perfume for ages! I just don't think I'd be willing to spend that much on it unfortunately. I can't wait to see wht you think about it! It has definitely got my curiosity!